Pictures from Series XII (Monumental Architecture) from the Library of Plates for Architects, published around 1910 by The Proprietors of the Architects’ and Builders’ Journal, Technical Journals Ltd of Westminster, London. Copyright status: photographs made and published in England before 1957 are out of copyright. There are fifty full-page plates, approx 17x25cm (a little under 7 × 10 inches). 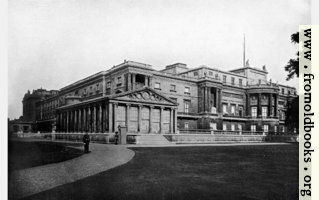 IV.—West Front of Buckingham Palace. 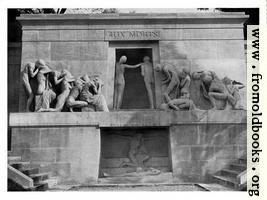 XXXIV.—Monument in the Cemetary of Père Lachaise, Paris. Monumental architecture. XXXIV.—Monument in the Cemetary of Père Lachaise, Paris. I.—Detail of Façade of the Old Museum, Berlin, with sculpture group. XV.—Scala Regia, House of Lords.